This is a fun, simple craft for all ages. It's also a good project for practicing making patterns. Set one piece of white paper out on the table. Place the second sheet of white paper over top of the first so all the edges line up. 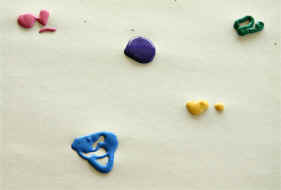 Smoosh your hands over the paper to spread out the paint that's sandwiched between the pieces. You might want a piece of newspaper underneath in case any paint oozes out the sides. Once the paint is dry, put them back together face to face (paint side to paint side) again. Cut a rough wing shape out of the pages. You can paint around the outside edge of the wings with glitter glue or one of the paint colors you used for the wings. Cut about 8 strips of construction paper 2 inches wide and 10 inches long. Decide what type of pattern you want to make. We made a pink, purple, pink, purple... Pattern for ours. 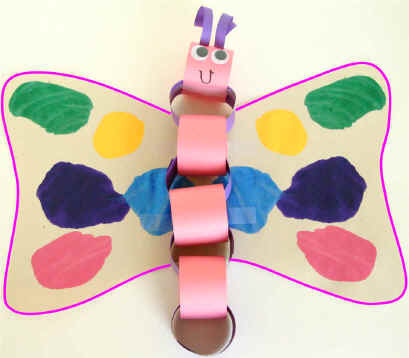 Repeat the process until you have a chain of construction paper rings just a little bit longer than your wings. Lay your chain onto your wings. Every spot the chain lies flat on the wings, use tape or glue to attach them. Cut two 1/4 inch by 5 inch pieces of construction paper.